Midwives in Utah are unaccountable for their actions. There is a deceptively long list of requirements for licensed direct entry midwives in the state of utah, but the law has no real teeth in it. Midwives who choose not to be licensed are not subject to any of the requirements. 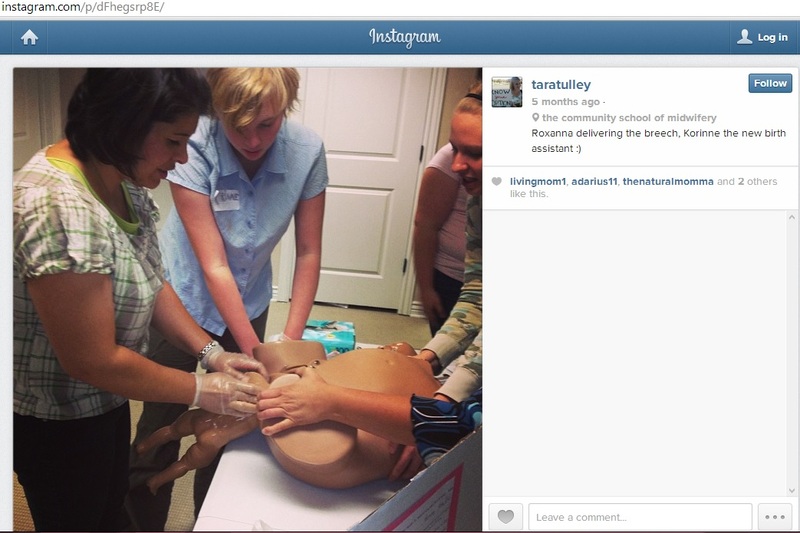 You can just declare yourself to be a midwife and practice, if you so please. 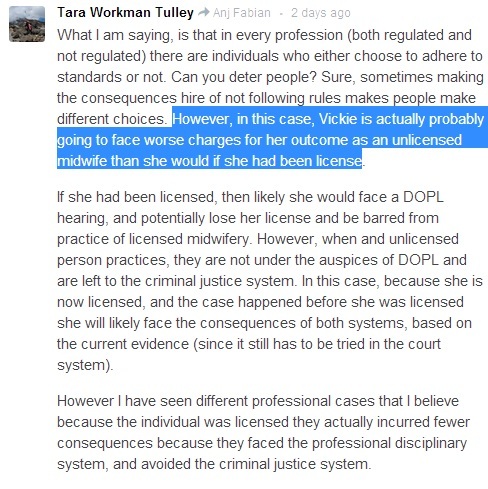 You can declare yourself a licensed midwife in utah and face no consequences for misrepresenting your credentials (I know because this happened to me, I went to a midwife who claimed to be licensed and was not, and every avenue I tried to address the problem with told me they could not reprimand her). This is a disgusting way to treat people. What is worse is how the midwifery community in utah decided that it was persecution for an investigation to occur. Simply investigating after a perinatal death is considered inappropriate, according to utah midwives. They seem to believe that any level of accountability for patient outcomes is too much. Utah midwives formed a watchdog committee in response to the investigations. There is no sympathy on the part of midwives for the parents of the child who died needlessly. 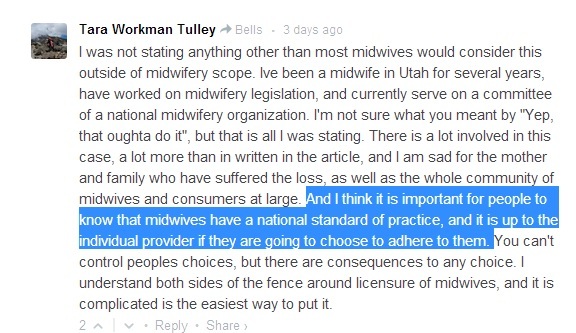 The people hurt by the midwife are a non-issue in the minds of most Utah midwives, apparently. You would think that a charge of negligent homicide would result in some real penalties for El Halta, who had caused other deaths by negligence in the past, but she was not sentenced to any prison time. Her sentence was probation and a court order to not attend any births. People who carefully read the salt lake tribune article about El Halta’s history will note that being charged with crimes in the past has never deterred valerie from attending risky homebirths, and it is unlikely that she will stop in the future. Valerie El Halta has also been sued for a previous infant death in a different state, but the fact that she did not carry malpractice insurance means the debt is basically un-collectable. Utah midwives are not required to carry malpractice insurance, so it is hard to get an attorney to assist when utah midwives hurt a pregnant mother or their baby. There is no safe guard in place to prevent a tragedy of this sort from happening again. I find this totally unacceptable. Birth attendants (of any type) are bound to make mistakes a certain percentage of the time, and should be accountable for the outcome. They should pay for any damage caused by their mistakes. Midwives in utah are also not bound by HIPAA. They have no legal obligation to keep your private health information confidential. Better Birth of Utah has resorted to talking about the (alleged) mental health status of past patients when negative reviews were posted to the internet, breaking the contract that states they will not discuss health information with anyone not involved with patient care (unless legally obligated to do so). There are midwife-run review boards like utah midwives organization or NARM, but they also do not have any real power to punish midwives. Valerie El Halta had her credentials revoked by NARM several years before the negligence in Utah, it did not prevent her from legally practicing in Utah. The other thing I found out too late was that the health department does not regulate one room birthing centers. You can run a birthing center however you want to as long as you restrict it to one room. This is a major loophole in the law that could cause many problems for utahans who assume that their birth center is up to code- when there isn’t one. I know that when I used Better Birth LLC as my birthing center I was perplexed at the fact that they had a washer/dryer combination in the SLC birth suites (“bellanatal birth suites). I knew from my time working in hospitals that medical linens usually have to cook at a high temperature in industrial laundry services in order to kill transferable diseases. Better Birth was under no such obligations to sanitize the sheets, blankets, towels, etc used at the birthing center. I am sure there are other examples of why it is a bad idea to let lay midwives self-regulate their birth centers. If a midwife harms you or your baby your only real recourse is court, and if you can’t find an attorney willing to represent you then you have to try your luck at small claims. There is a maximum of 10,000$ that can be rewarded in small claims (about double what most states offer), but it doesn’t even begin to compensate someone who lost their life, child, or functioning at the hands of a midwife. I doubt that most Utahans find this state of affairs acceptable. Utahans generally place a high value on children and family, and these regulations undermine the safety of infants and pregnant mothers. Mistakes in the world of prenatal care and childbirth carry a high price for the parents and children affected. I believe that people who manage labor and prenatal care should be held accountable for their actions.